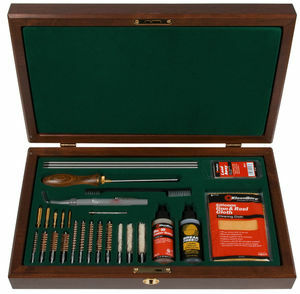 The Armorer is a truly deluxe kit for the astute gun owner. The rich wood tones of a solid cherry presentation box are beautifully blended with a useful mix of cleaning components and accessories, neatly presented in a hunter green tray. NOTE: Due to regulations this item may not be shipped by air. Please allow longer delievery time.